Marlie and Me: Wordful Wednesday: Happy Halloween! The local Halloween celebrations kicked off on Saturday so I have advanced photos of my awesome twosome in their themed costumes. 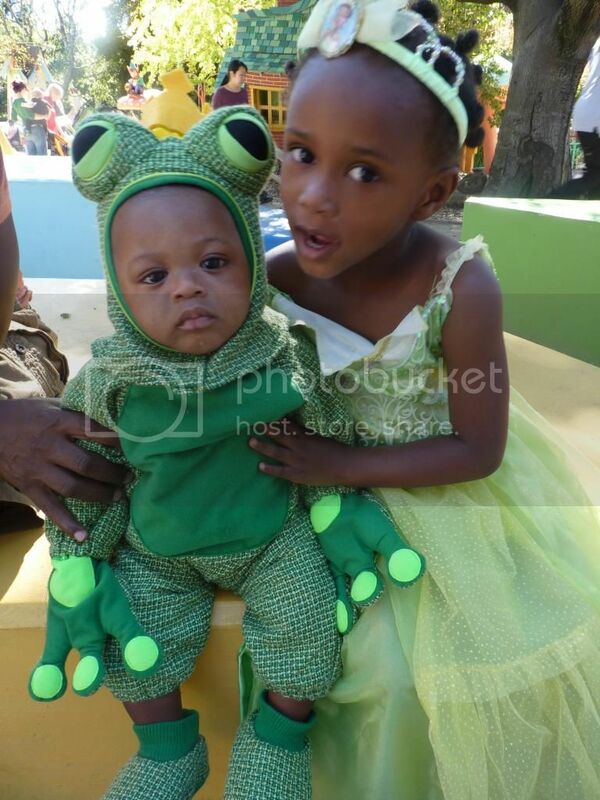 I present to you, Princess Tiana and the Frog Prince! The Princess is having a ball, but the Frog Prince not so much. He was sleepy and hot under the collar. Temps were in the mid-70s that day! Little does she know she is going to kiss some real frogs when she starts dating. 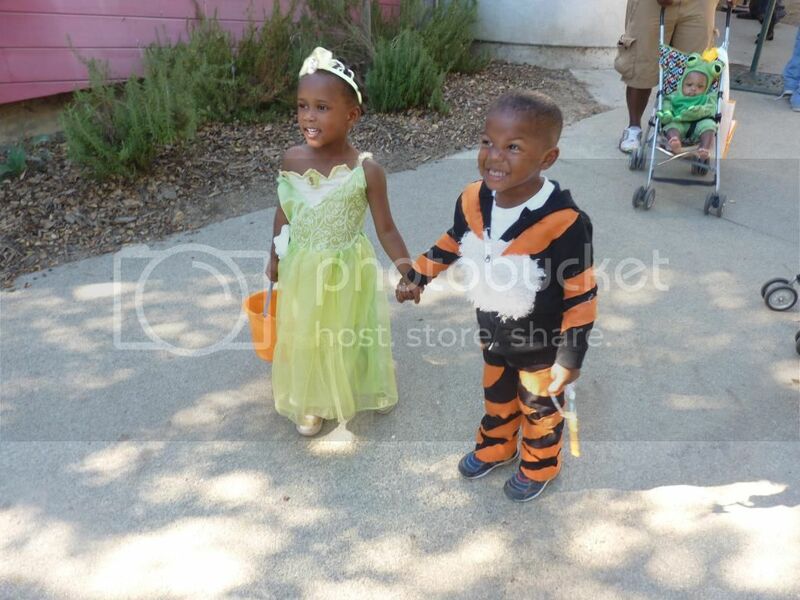 Hanging out with her trick or treat buddy Tigger. The Frog Prince is on break. OMG! We LOVE that movie! It makes me sad that there is not more Princess Tiana included with Disney princess stuff. For instance, our pediatrician has "princess" stickers and they never have Tiana. They always have Snow White though and the Disney Snow White makes me want to stab my ear drums with hot pokers, I hate her voice! Tiana on the other hand, has a lovely voice, a good character, intelligence, a good work ethic, and is beautiful, to boot. Maybe I'll start some sort of "We Want Tiana, Oust Snow White!" campaign. Awwww those are the best costumes ever!!!!! He looks just like you!!!! They are adorable!!! Love the theme. They are so cute!!! Just adorable! That is just too adorable. Love the costume theme. The look on the little guy's face on the top picture is just priceless. Omg! Those are the cutest costumes. How perfect. Omg they are the cutest!! I can't wait till my son can go trick or treating too. Oh my goodness, what a cute pair, I'm loving that froggy costunme! AHHHHH! I love that you do costumes that go together! We are big on that too and it is always a hit. This year the kids refused to agree on anything and I am so sad about it! The princess and the frog prince, I nearly died laughing. Your son is so darn cute in that outfit, you should enter him in a contest!! Love your beatiful daughters outfit too! What an adorable princess and her frog! 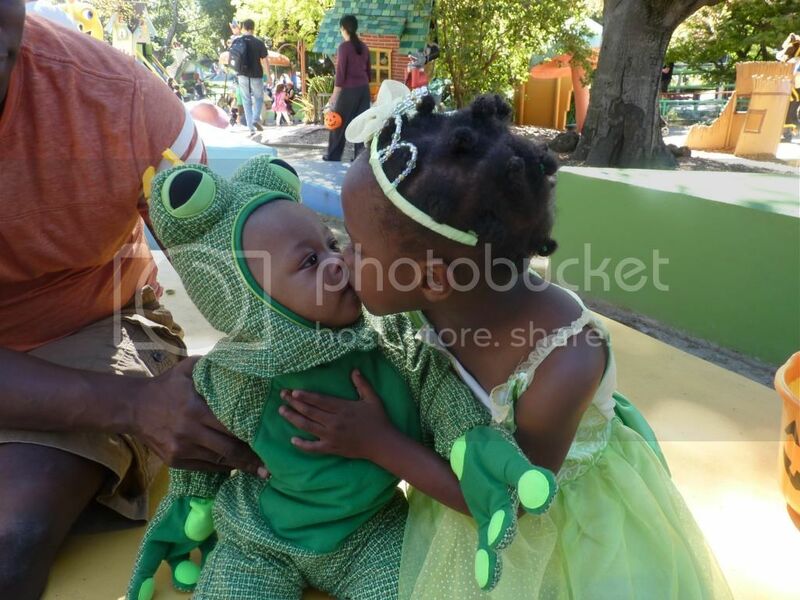 Glad you little princess had fun and got to hang out with her friend while her frog was on a break. Talk about adorable.... The frog costume is out of this world. Looks like you'll be having a blast tonight as you knock on strangers doors. TeeHee will be my first year with Sofia Marie. Looking forward to her first Halloween. Seriously cute! That frog, gah! OMG, I can't even stand how cute your kids are.